Bruno and I are back and safe and sound! We are so happy to be at home - in our own bed and with our fur babies. What a wonderful time away we had - but there really is no place like home. Thanks to all those that followed our adventure on Facebook and left comments here on my blog too. It was so much fun knowing that others were following our adventures too. 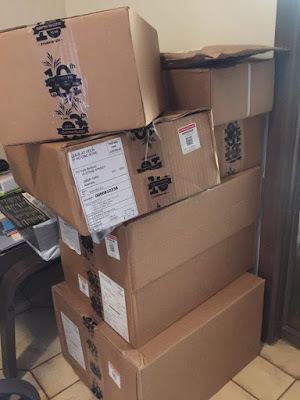 When we arrived back at my Mother in Laws place this was waiting for us - Lots of Big Brown Boxes full of new Stampin' Up!® goodies! Woo Hoo!! And also our beautiful Fur Babies - Jasper and Bella. 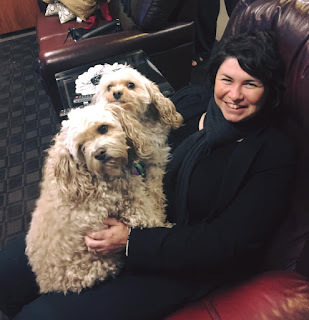 They were giving me lots of kisses and hugs when we got back. I really missed them while we were away. I also made this card before I left as I knew I may not be feeling creative with jet lag! Surprisingly I am doing well which is great. Hoping that I don't get hit later in the week but having lots of sleep and making up for all the sleep we lost travelling over. Plus we did so much while we were away. You just don't want to waste anytime at all. This is for a good friend of mine that helps me out often and I adore! She is just as Crazy as me so this sentiment will be perfect. I used the new thoughtful Banners Stamp set for the sentiment. 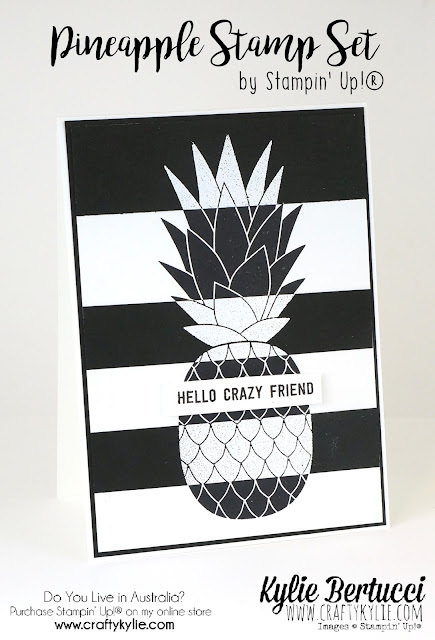 Can you tell I am loving this Pineapple stamp set?? I love the pineapple done like this. I stamped on Whisper White with Basic Black and the Basic Black is stamped on with white embossing powder. I then cut the strips and layered them on top. So fun and works so well with the sentiment. I will be back soon with some videos of my unboxing all the deliveries above. It was so much fun checking out all my new products. Remember that if you live in Australia you can shop with me and if you use the host code JTTAVZ6Q to receive amazing gifts at the end of the month for ordering with me. Looks more complicated than it is! Nice! Wow! That is an impressive card! I will have to try that technique. Thanks. Fun! Love the graphic appeal of it. Welcome back!